I was looking around me and felt pretty lost, somewhere in West Lothian. So close to Edinburgh, yet in this moment it felt further away from civilisation than ever. Shouldering the bike I climbed the northern side of West Cairn Hill, a steep slope, looking back in awe, making very slow progress. Down a rough track through the heather I joined a track at the Cauldstane Slap, which was, it was early spring, still pretty boggy. And suddenly there was this white sign, featuring a cow and the words Cross Borders Drovers Road. I wondered how far the old drovers routes would extend, and whether that could be a great route to cycle on the mountain bike. As I took the last sip of my coffee at the Traquair Arms the next day after a nice stroll on the railway path from Peebles to Innerleithen. While looking over the edge of my coffee cup I spotted a leaflet. Suddenly the hard work the day before made perfect sense. The leaflet featured the first section of the Scottish National Trail, devised by Cameron McNeish. I had read about the trail somewhere before, and most possibly forgotten about it again. A few weeks later I was off on my singlespeed bike, heading off from Peas Bay on the first section of the Southern Upland Way, before taking some more roads to Kirk Yetholm. After a good night’s sleep the destination for the following day was Edinburgh. It was cold in the morning I remember, but with a few small alterations I followed Cameron’s suggested trail. 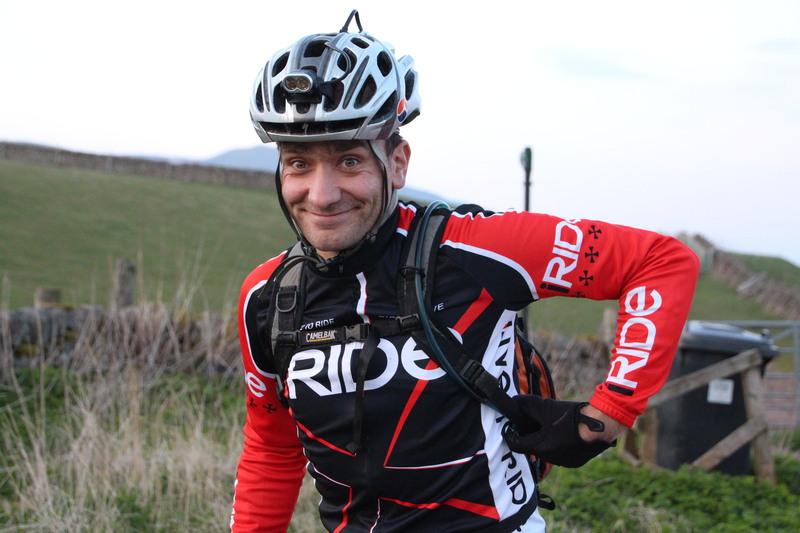 I made it to Edinburgh in the darkness; this was the perfect training ride for the Highland Trail 550 for me. Public Footpath to Ormiston. I turn back and smile. Suddenly it all makes sense. A day before I had met Kim, a nice guy who is the director of the Edinburgh Festival of Cycling. In usual fashion I had left a comment on the Festival’s Facebook page, mentioning that there was so much more to cycling, especially off-road. A bit more dirt wouldn’t hurt for sure. Over a cup of coffee we discussed a few ideas, and somehow I agreed I would think about a bikepacking adventure as part of the festival. And there I was, armed with a GPS; looking for a route across the Lammermuir Hills and through East Lothian. It was cold, still winter. But halfway in the ride I couldn’t stop smiling. This was it, a bikepacking trail around Edinburgh. If I would find a good route to pass the Lammermuir Hills, and could manage to find a way from Lauder on to Innerleithen, and combine Cameron’s route with some trails in the Pentlands, that would be it. The idea for the Capital Trail was born. Weeks passed, and I almost became obsessed with devising the perfect route. Planning a 235km bikepacking route was no easy undertaking, especially with the ambition to make is as scenic and demanding as anyhow possible, while squeezing in as much attractions on route, like the Glentress and Innerleithen trails. I spent the following weekends riding all parts of the trail, most of the time not only one, but two or three different variations. More than once I got lost, frightened in the dark when hundreds of sheep eyes starred at me, I walked, pushed and fixed punctures, but in the end it was all part of the idea. I asked locals, fellow mountain bikers and walkers, finding new trails and documenting everything with GPS routes and pictures. The more I rode the trails, the more I realised how much amazing mountain biking Edinburgh has to offer. I hope that the Capital Trail will inspire more people to stay in this beautiful part of Scotland a little bit longer, and start their bikepacking adventures with this route. Looking at the entries to the ride so far, it certainly has inspired many. I am looking forward to the 13 June, when 100 bikepackers will leave Portobello Beach to tackle the route for the first time. There are still a few spaces left, which will be releases once the Edinburgh Festival of Cycling launches on 24 April. If you would like to register your details, you can add them to the waiting list at www.capitaltrail.eventbrite.co.uk. The almost final Capital Route can be viewed and downloaded here (subject to change). A perfectly timed post! Thanks for all the info!